T.barber Band is currently living in Hazel Green, Alabama, working as a President in "GSCI- RCStudio" and is interested in Advertising & Media, Art, Entertainment, Gifts / Accessories, Internet / IT. T. Barber Band has been playing in the Huntsville, Alabama area for twenty-five years and was an Icon at the \&quot;Chicken Shack\&quot; for twenty years. T. Barber Band is now sharing their long rich history of original music with the world. Come and help us pass the word and music around. 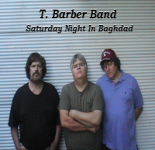 This profile is owned by T.barber Band. Send a message to this person to delete this profile.